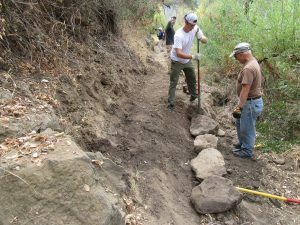 Over 20 volunteers, including 9 from CORBA, 8 from Girlz Gone Riding and 6 from the Santa Monica Mountains Trails Council, worked for four hours this past Saturday morning to fix up a seriously degraded part of Crags Road in Malibu Creek State Park. This section, just before the M*A*S*H site, is fondly known at the ‘Creek of Doom’ or the ‘Rock Garden’ because of the rocky and narrow nature of the trail, going along the edge, and then the middle, of the dry creek bed. This trail has not seen any work on it for years and had become very overgrown and eroded. As a result of the rains last winter, several trees had fallen on the trail and now were lying at the side, their branches still poking into the trail itself. Under the guidance of experience trail crew leaders, mostly from the Trails Council but also from CORBA, the volunteers split into several groups, most of which focused on clearing back the fallen trees and other brush, with the rest focusing on fixing the trail tread. 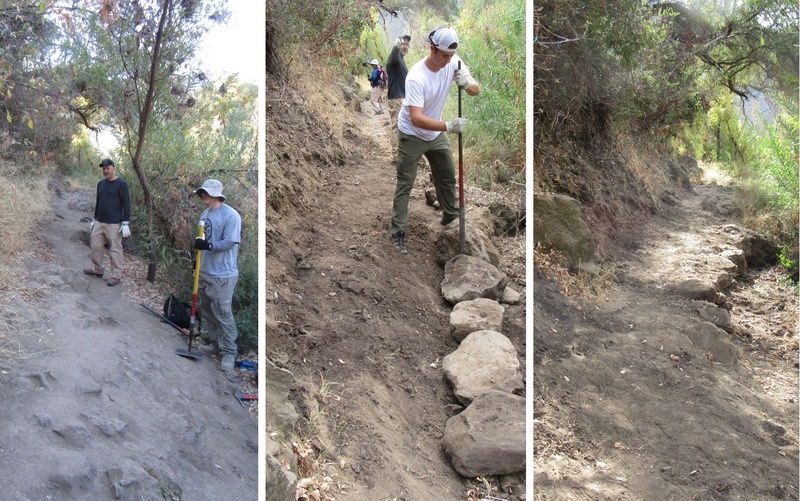 Before, during and after photos of one section of the trail that was restored. Lunch at the Urbane Cafe afterwards to thank all the volunteers who did such a great job! 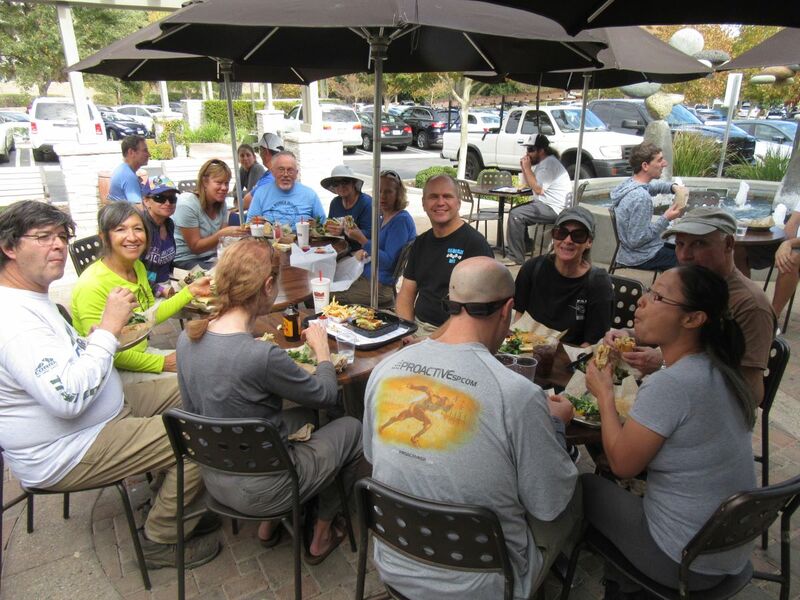 After the work ended, CORBA treated the volunteers to a lunch at the Urbane Cafe and the Habit Hamburger Grill. You can see more pictures of the trailwork in CORBA’s photo gallery. 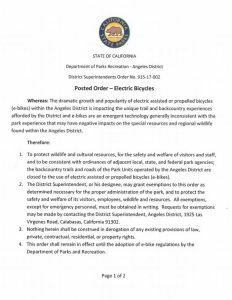 Electric mountain bikes are already prohibited from Mountains Recreation and Conservation Authority and National Park Service trails. Some trails and many popular bike routes in the Santa Monicas cross more than one of these jurisdictions. This had led to confusion as to where e-MTBs were allowed. Sap’s order states that consistency with neighboring jurisdictions is part of the justification used. 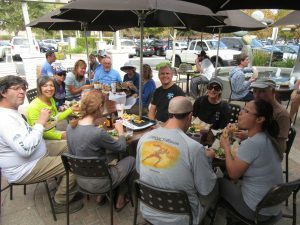 The California Department of Parks and Recreation current policy regarding e-MTBs leaves the decision at the District level, until such time as a formal state-wide policy is adopted. The order goes into effect on October 1st, 2017. Enforcement is expected to begin then too, but we do not yet have information on how it will be enforced. 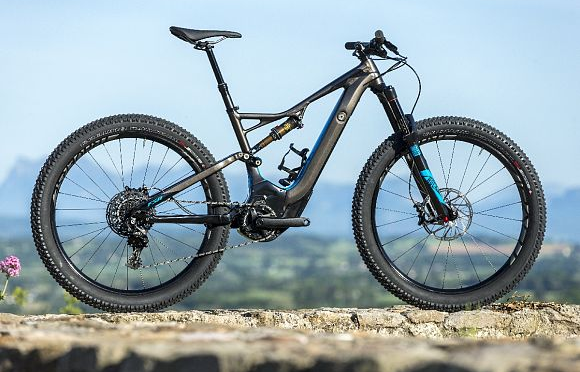 As one can see in photo above, it can be extremely difficult to distinguish some e-MTbs from their non-electric brethren. Sap’s order does appear to allow for exemptions. Law enforcement and emergency personnel may still use e-MTBs in the performance of their official duties without a prior written exemption. 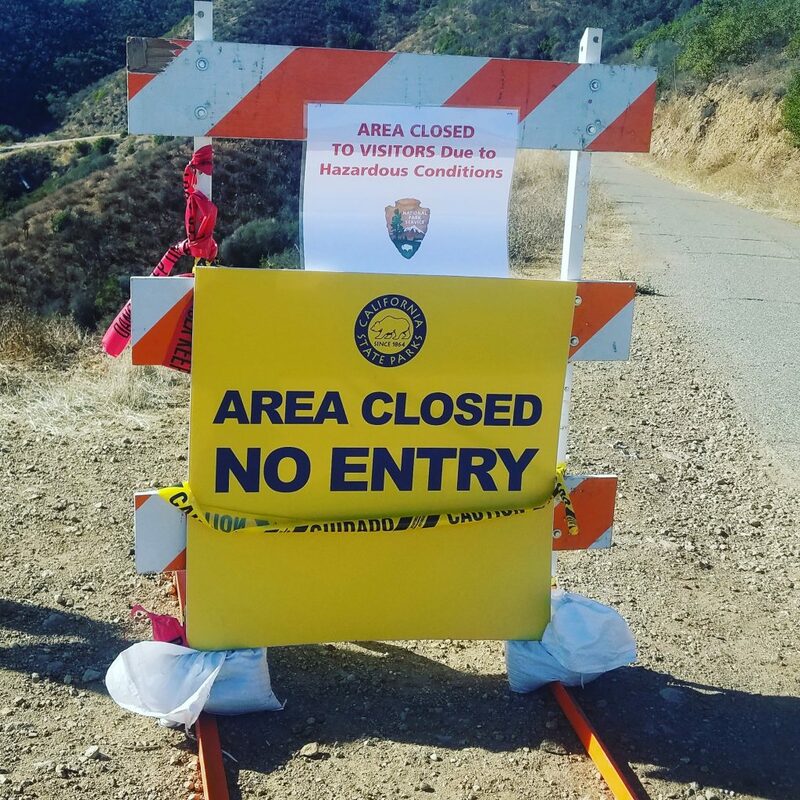 Currently, Conejo Open Space trails are generally open to e-MTBs, as well as roads and trails appearing on the Angeles National Forest MVUM (Motor Vehicle Use Map). Check the People for Bikes e-MTB Map for more information on where to legally ride electric mountain bikes. A San Rafael man who built an illegal bike trial on federal land in 2001 is in legal trouble again – this time for carving a trail in China Camp State Park, authorities said.Michael Philip More, 54, was charged Thursday in Marin Superior Court with willful or negligent destruction or removal of plants and dead wood, diverting or obstructing the natural flow of a stream, resisting a peace officer and allowing a dog to roam off-leash in a restricted area, prosecutors said. More is accused of digging an illegal bike trail into a hillside, hacking down tree limbs and constructing rock paths through two drainage ditches, authorities said. The quarter-mile trail is at the end of Robinhood Drive in San Rafael’s Glenwood neighborhood, which borders the state park. The cost of repairing the damage is estimated at $20,000, said Kathryn Mitchell, a senior county prosecutor. More, who could not be reached for comment, has pleaded not guilty. His attorney, Patrick Ciocca, said More would be “loathe to engage in a public discussion” about the allegations while preparing his defense. “It would not be beneficial for him to enter into a public dialogue,” Ciocca said. Park rangers received a tip about the trail in March, when a resident noticed unusual activity in the area. A ranger investigating the trail found More at the scene, and More allegedly tried to flee. More was cited, but not arrested, while prosecutors reviewed the case. He is scheduled to be appear in court on May 9. Alex Burnham, president of the San Rafael-based Access4Bikes advocacy group, said he is concerned that the case will tarnish the entire bicycling community and inflame tensions between cyclists and noncyclists. The issue of trail use has fueled years of acidic conflict among hikers, bikers, equestrians and dog owners, with the county sometimes resorting to barbed wire to block cyclists from trails. More was once a prominent bicycling activist, serving on the Marin County Open Space District Trails Committee. But he resigned the position in 2001 when federal authorities accused him and two other men of carving a four-mile illegal bike trail into the Golden Gate National Recreation Area near Bolinas Ridge. All three men were indicted by a federal grand jury and eventually pleaded guilty to misdemeanors. They were ordered to pay more than $34,000 in restitution for the destruction to federal property, placed on probation for three years and banned from the federal park system during probation. Governor Schwarzenegger’s plan to combat California’s projected budget crisis includes across-the-board program reductions, including many cuts to the state parks department. 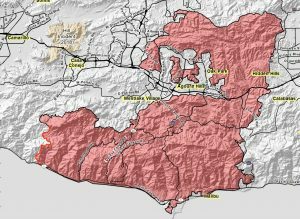 The new proposal would close 48 parks, including popular destinations like Henry Coe and Topanga Canyon. California State Parks has been victim to several significant budget reductions in past years and the new plan would seriously imperil the agency’s ability to serve Californians, including more than five million mountain bikers. Take Action! Send a message to the governor and your representatives! Tell the Governor and your state legislators that these proposed closures are unacceptable. Millions of Californians rely on State Parks for their main source of recreation. At a time when health and obesity are major issues for California citizens, parks are a viable resource that contributes to mental and physical health. The California State Park System is one of the best in the nation. The proposed budget cuts, on top of significant past reductions, will further jeopardize stewardship of the state’s precious natural and cultural resources. In comparison to other departments, State Parks has an extremely small budget and therefore a reduced capacity to absorb cuts. The Governor’s plan calls for a $13.3 million reduction, but this will close 48 parks and reduce seasonal staff hours by 50 percent. The State of California is currently in the General planning process for this fairly new State Park. The plan calls for some of the existing trails to be closed to all users, some trails will be open to hikers only. The Old Santa Susana Stage Road may be closed to Mountain Bikes due to its Historic Status. There are also some trails near Oakwood Memorial Park that the Park Service may be considering closing to bikes and Horses to protect cultural resources. We need your input. For more information, please go to the State Parks Site and check out Preferred Plan on the right side of that page. This is a PDF map of the area and it shows the trails. If you ride this area and know of trails that are not on the map (if they are not on the map they may be closed)and you feel they should remain open for Mountain Bike use or have other feedback, CORBA would like to hear from you. Please contact Hans with any feedback or concerns.